Fog shrouded The Mountain yesterday just after daybreak, and in the midst of heavy mist, a brilliant cardinal appeared in the herb garden by our back door. We have placed a bird bath in the yard, but our visitor sought food rather than a morning bath (not that he needed one). Hunched over one of our plants, his posture appeared to be that of an old man, but his familiar "chip" sounded youthful and threatening. I knew that if he were mating, another cardinal intruder might become a victim of some dive bombing and combat activity. If this cardinal had engaged in combat and chased an intruder away, his victory song would have been unmistakably joyful. I've read that if a cardinal is placed in front of a mirror, he perceives his reflection as an intruder and may spend hours trying to get rid of his image. 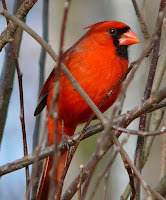 During my winters in New Iberia, Louisiana, I enjoyed a cardinal visitor who, seeing his reflection in my window, sat on the sill outside my study for weeks. Little did I know that he was in defense mode, protecting his territory against another male cardinal that might be seeking a mate. I thought he was befriending me! I think that my yard cardinals live in a thicket near our drive and consort with their neighbors, a thrasher family. 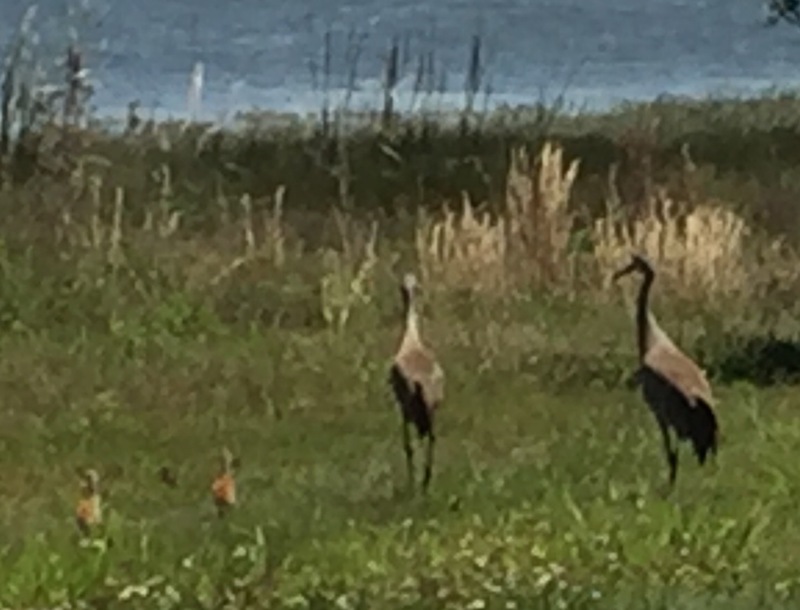 They probably share meals of unwanted insects and seeds from weeds. The thrashers graze brazenly in my front yard, especially after heavy rains like the ones we've been experiencing. Although most people regard cardinals as bearers of good fortune, humans are forbidden, by law, to keep a cardinal as a pet. I've read that the male cardinal shows his affection for the female by feeding her, beak to beak, to express his love, but I've never been a witness to this courting activity. Cardinals are among the most difficult birds to photograph, particularly in a dense morning fog, but I'm sorry I didn't try to snap one of the bird that landed in our herb garden yesterday morning. If I hadn't been due to attend Morning Prayer and Eucharist at St. Mary's at 7 a.m., I would've staged a stake-out. 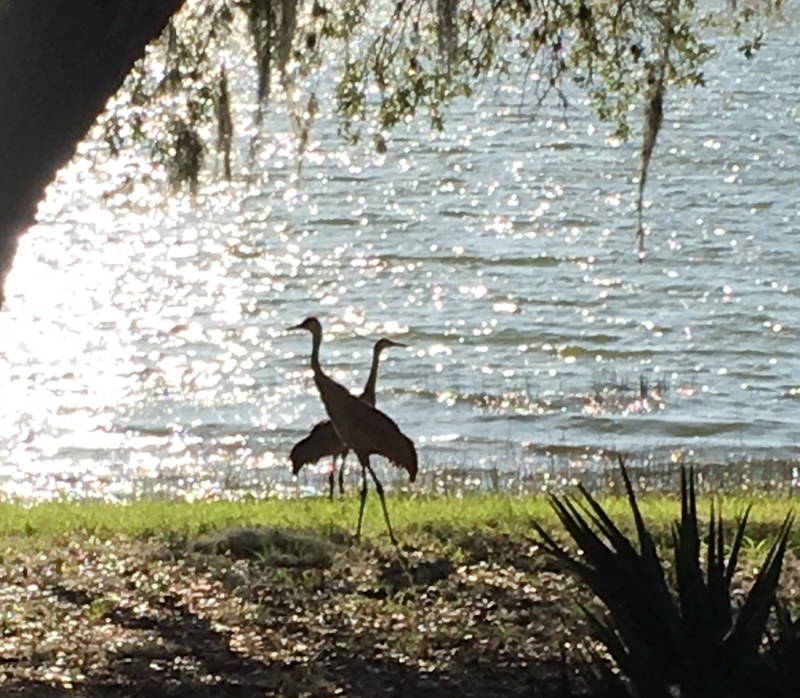 Later, in the afternoon, I did do a one-hour stake-out, and one flew over the front porch daring us to catch him in flight as he disappeared into the woods. 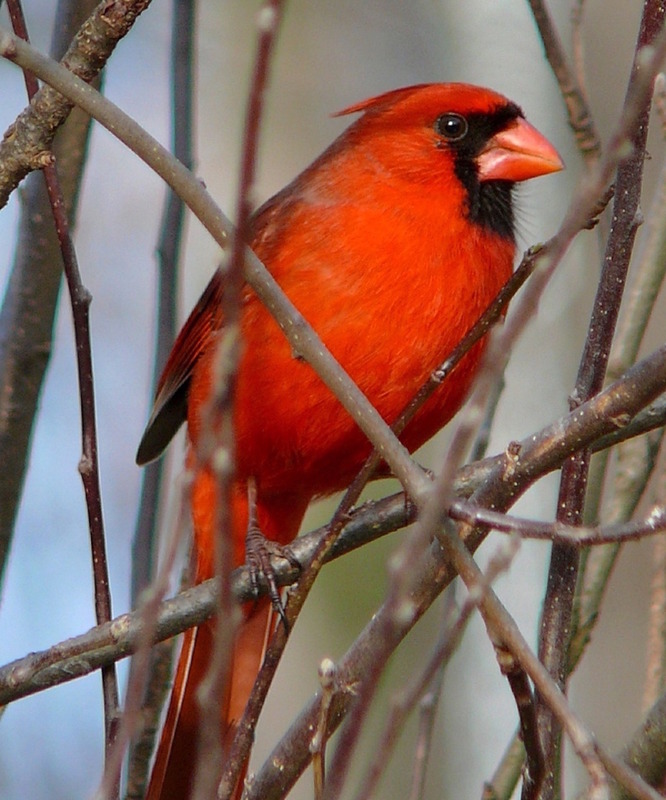 I'm among those who believe that cardinals bring messages of blessing. They also symbolize power and wealth. My daughter Stephanie and I believe that they represent a deceased loved one who has returned for a visit. In our case, it's my mother Dorothy (who loved red) who's telling us she'll always be with us, assuring us that we can handle any difficult problem and that we'll have everlasting vitality. At 82, that's a message I want to hear her "chip." 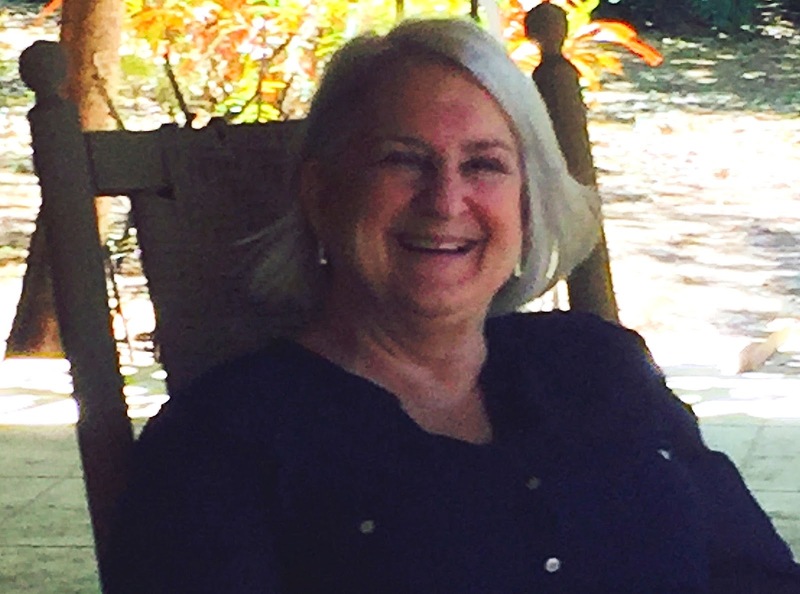 A few years ago, I reviewed a book of poetry entitled Floating Heart by Stuart Friebert, a writer whose work has been published in numerous literary journals, including Pinyon Review, an independent press in Montrose, Colorado. Friebert responded to the review by sending me copies of several books featuring his translations of books by the German poet Karl Krolow, and we corresponded sporadically about the books that are included in a series entitled the Field Translation Series, founded by Friebert at Oberlin College in Ohio. This week, Friebert made another appearance on the publisher's list of Pinyon Review with First and Last Words: Memoir and Stories, a stellar collection of literature about German-Jewish characters and Friebert's sojourn in Germany as one of the first exchange students following WWII, as well as memorable short stories from Friebert's wry pen. In the Prologue to this volume, Friebert at once captures the reader's interest with a commentary about how Nazi-German infected German classical language, citing Victor Klemperer's Language of the Third Reich, in which Klemperer notes the word "Umbruch," a beautiful poetic word before the Nazis perverted it, which had to do with "turning the earth over to plant anew but was diabolically redeployed to mean a glorification of being rooted in the soil of the Fatherland..." Although Friebert claims he never became a linguist, he fell under the spell of German poets, particularly Rilke, and was inspired to study German abroad by Professor Doberheim who was a refugee from Darmstadt where Friebert was sent as an exchange student. Friebert later studied with Martin Joos who advised him that the only salvation for Germany was if Jews returned (Friebert's heritage) ... "to the language, the literature, to the land as well. That in and of itself would be a miracle...whatever you do, read German, teach it if you can, and above all live it." When Friebert crosses the ocean on the Queen Mary, he experiences a "rogue wave" that injures a priest who has become a companion to him and Ellie Klarner, a fellow student in the exchange program. The ship lands in Rotterdam to seek medical help, a place described by bitter crew members as a city where citizens had been shown no mercy by invading Germans. Friebert becomes more aware of Third Reich corruptions after he meets victims of WWII when he reaches his destination at the Technische Hochschule or the "TH" where he has been sent to study. After leaving Germany, he faces a career decision, pondering whether to help ferret out former Nazis, or to stabilize the new democratic Germany, or to apply for a Foreign Service job. Instead, he returns to his studies, completes his B.A. at Wisconsin State University, takes an M.A. and a Ph.D. at the University of Wisconsin at Madison in German Language and Literature, and later teaches at Mt. Holyoke College and Harvard, settling at Oberlin College where he taught German, founded and directed Oberlin's Creative Writing Program, The Field Translation Series and Oberlin College Press — all unfolding as a unified career path, which he had pondered following his year abroad. When Friebert sent me volumes of Karl Krolow's poetry, he offered his opinion about writing the kind of poetry that impassions readers — the notion that learning another language and translating the poetry of that language results in successful poetry in a writer's native language and voice. His fifteen volumes of poems and thirteen volumes of translations bear out this advice. First and Last Words is a living legacy that recounts the past without surrendering to an easy sentimentality, and is one of those timeless volumes that showcases a master of language and lends credence to an international audience. 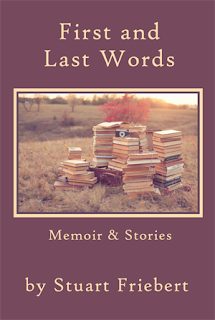 Readers will enjoy three fulsome sections, including miscellaneous short stories and memoir stories, my favorites being a fish tale entitled "Some Lunkers," and "July 14-15/1998," a story about Friebert's father's death following rehab from a broken hip. In the story, Friebert discovers that his father had scrawled poems written by the poet Miroslav Holub in a prescription notebook. Friebert had sent his father translations of Miroslav's poems, and the poem that moved his father the most was "Autumn," regarding the end of life. "But next year/The larches will try/to make the land full of larches again/and larches will try/to make the land full of larks/And thrushes will try/to make all the trees sing,/and goldfinches will try/to make all grass golden/and burying beetles/with their creaky love will try/to make all the corpses/rise from the dead." Friebert has created a tour de force volume, writing from a well of memories and nostalgic thought that will perturb some and delight others in a range of subjects and characters with sharp bits of philosophy couched between the lines: "The best science is often the simplest way through the maze of possibilities. 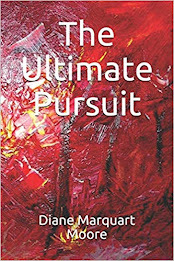 The key, of course, as it often is in most of life's exigencies, is being able to formulate the decisive question at the outset of your investigations..."
Order from Pinyon Publishing, 23847 V66 Trail, Montrose, CO 81403. Also on amazon.com. One of the unique groups here at Sewanee meets at Mooney's to knit yarn art. This month, the knitters added their art to an installation for the Mountain Goat Trail that was created by school and neighborhood groups — a colorful exhibit on a three-mile stretch of the Trail that featured decorated walking sticks, God's eyes, google-eyed frogs, pom-pom trees, birds, granny squares, a tree sweater, hanging shoes...totems of art for viewing by the Sewanee community that opened on April 1. The project was planned by Patrick Dean of the Mountain Goat Trail Alliance and Christi Teasley, Grundy Area Arts Council. My friend Victoria Sullivan, fascinated with the whimsical art of the knitters and crocheters, snapped photos as she made her daily walk on the Trail and shared it with me as I seldom get out walking in the early morning. As a believer in the adage, "One Picture is Worth A Thousand Words," this blog will give readers a view of the craftsmanship that exists here on The Mountain, and actually, in most counties of Tennessee. Unfortunately, thieves took away more than half of the installation on April 9, and local police are still looking for the robbers. The heavy fog this morning reminded me why I frequently call Sewanee, TN, my second home, "Grayburg." During this morning's services at St. Mary, I kept looking out the window overlooking the bluff and countryside beyond for sunlight, but it's now 10 a.m., and the fog still shrouds all signs of spring, including a few blooming dogwood and forsythia scattered about the woods. The dense fog reminds me of a program I presented to the Fortnightly Club in February — one about the Great Smoky Mountains Park, another setting with a plethora of gray days. The program focused on the part that photography played in establishing the park as a national icon in the southern Appalachians. Western parks, such as Yellowstone and Yosemite, were carved from the public domain, but each acre of the Smoky Mountains was held in private lands made up of thousands of small farms and summer homes. A decade-long effort resulted in funds being raised to buy those lands because, originally, the Federal government wasn't going to put up any of the money to acquire property for a park. So the states of North Carolina and Tennessee, composed of ordinary citizens and philanthropists — even school children — began to raise the money. Their campaign was aided greatly by a group of photographers who supported the cause. During the early 1900's, when photography was in its infancy, professional photographers had to tote large, cumbersome view cameras, fragile glass plate negatives, and wooden tripods into the wilderness to photograph scenery that became the Smoky Mountain National Park. A photographer would set up a shot and wait, sometimes hours, for a moment of light before clicking the shutter to record images in black and white. The photographers were also avid hikers. They logged thousands of miles carrying tents, bedrolls, food, and fifty pounds of cameras and various equipment on their backs on unfamiliar, rugged ground. They also build trails and measured, mapped, and named most of the land features that would become the Great Smoky Mountains Park. They made thousands of pictures of trees, waterfalls, and mountain peaks in all kinds of weather and created portraits of mountain people working in their homes, on their farms, and with various crafts, leaving a cultural record of the mountain dwellers. Many of the facilities and restoration of historic buildings in the Great Smoky Mountains Park was done by the CCC's, (an organization to which my father belonged but not in the Smoky Mountain Park), and many of the trails, beautiful stone buildings, and bridges in the park are examples of their work. However, the photographers were the real movers and shakers in the campaign to establish the park. They campaigned, "through their lenses" to pique the interest of government officials and private donors to acquire 6,000 small farms and large tracts that had to be surveyed, appraised, dickered over, and sometimes condemned in court. Lumber and timber companies with standing inventory required compensation, and some people were given lifetime leases if they were too old or too sick to move. Finally, in the late 1920's the Legislatures of Tennessee and North Carolina donated two million dollars each for land purchases, and by 1928, five million dollars had been raised. Then the Laura Spelman Rockefeller Memorial Fund donated five million dollars. The Great Smoky Mountains Park was formally dedicated by President Franklin Roosevelt in September, 1940 as he spoke from the Rockefeller Monument at Newfound Gap astride the Tennessee-North Carolina state line. Ansel Adams, who was famous for photographing Western national parks, once set out for the Great Smokies following WWII and spent only a week in early October, making 47 images, four of which were published and three printed. 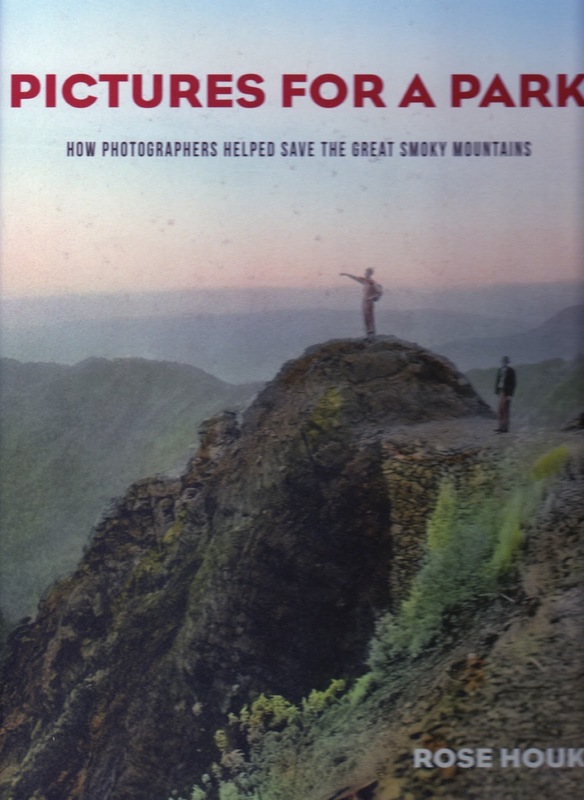 In the book, Pictures For A Park, How Photographers Saved the Great Smoky Mountains, by Rose Houk, Houk tells the story of Adams complaining about the hazy light in the Appalachians ("Grayburg! "), comparing it to the strong light in California's Sierra Nevada. Adams wrote to a friend that the Smokies were "Okay, but are going to be devilish hard to photograph." A copy of Adams' photo entitled "The Dawn, Autumn Forest" appears in Pictures For A Park, a black and white close-up of a stand of trees, "their luminosity displaying Adams' prowess with light and lens and darkroom technique..."
My favorites among the photographs I viewed in the book by Houk were those of the faces of the mountaineers in the Great Smokies. Many of them are melancholy and weathered, and I wasn't surprised at the expressions on the faces of the mountain folk — the photos were probably taken on a day like today in "Grayburg!"